This, the 300th post at Dumpling Hunter, marks the 5th anniversary of the launch of this blog! In this time the blog has accrued 69,351 page views from 42,441 visitors, with vegetarian and vegan being the most viewed topics. The United States is home to the largest number of readers, bu the blog is big in South Korea and Singapore. Best Dumpling in the past year was the Lamb and Pickled vegetable dumpling at Dumpling Galaxy, and if you don’t like that dish they have 99 other styles of dumpling. Best Vegan Dumpling was the limited edition wastED veggie dumpling at Mimi Cheng’s which were filled with ingredients that typically get composted during the prep process for Mimi Cheng’s other dumplings. Brilliant idea and super tasty. Biggest Disappointment was Drunken Dumpling which got a lot of love from the NY Times and foodie pages for its giant soup dumpling, but when I went there the flavors were bland and the pork buns were under cooked. Dim Sum of the Year is awarded to Yank Sing in San Francisco, make sure you get the shrimp Har Gow. Best Steamed Bao goes to Trans World Market in Hadley MA. 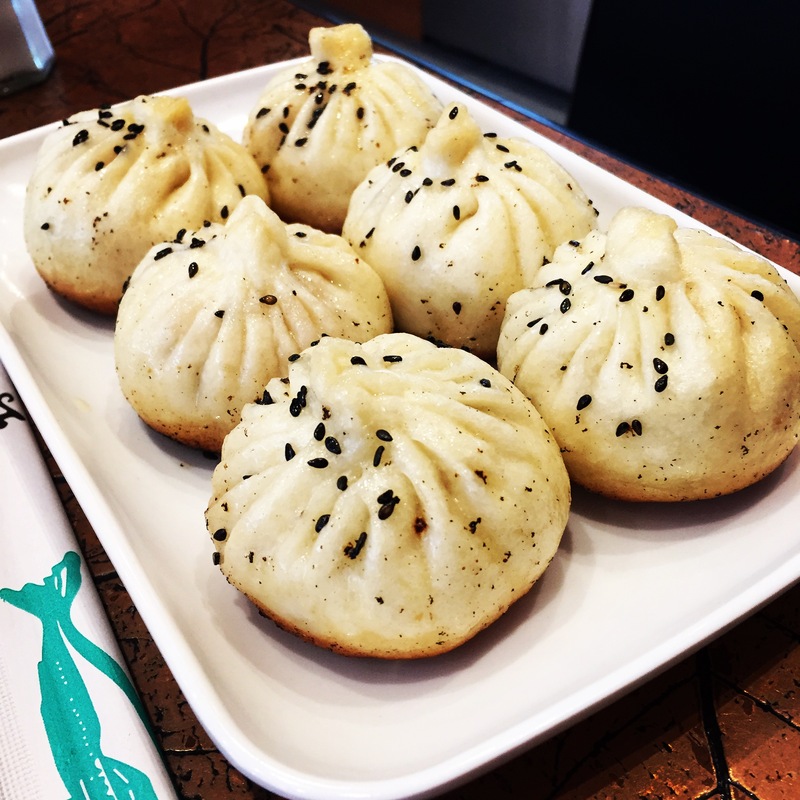 Get these giant pork, Chinese sausage and egg filled bao while you can, the word is that the lady who makes the Bao is retiring from the Bao-making game. Best New Comer is awarded to Coffee Break is a french pastry/coffee shop that suddenly decided to add Shanghainese dishes to the menu. Their Sheng Jian Bao just keep getting better and better. Biggest Surprise was Mi Lah’s vegan Vietnamese at Philadelphia’s Amtrak station, their BBQ-Seitan “Pork” Bao was really good. Best Frozen Dumpling in the past year was Assi Brand Host Cooked vegetable Dumpling which are vegan. Welcome Back! In December 2016 Yakitori Sun Chan re-opened after being knocked out of commission for six months by a ConEd gas mains problems. Congratulations!!! It takes a lot of eating to get through all these reviews!!! But reading about them is great fun.